Breaking the Game is the best Scrabble book every written! This book explores basic Scrabble concepts (such as anagramming and board vision) while elucidating how to win at Scrabble, including chapters on leaves, fishing, setups, and endgame. This Scrabble guide is the go-to reference for any Scrabble enthusiast who wants to win at Scrabble! Written by one of the best Scrabble players in the world, Breaking the Game delves into Scrabble like you’ve never seen before. Whether you are a new player who wants to beat your friends and family, an avid word lover who wants to know about Scrabble, or an experienced Scrabble master, this Scrabble book will take your game to another level. This isn’t just about learning how to play Scrabble: this book is breaking the game. Note: For International players in Europe, Asia, etc. please visit this page for the international version! For those of you who want a taste of this amazing Scrabble book, I have provided a Table of Contents as well as the first page of each chapter and a few individual sample pages. You can also go to Amazon and read the first ~20 pages of the book. Enjoy! 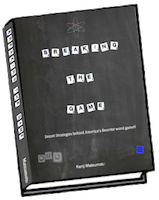 Words of Wisdom is my sequel to Breaking the Game, providing you with complex strategy for advanced Scrabble players. Beyond Words is my book for anyone who wants to master the hit game, Words with Friends.